I have my sights set on fall baking, and can’t wait to have the sweet scent of baked apples and simmering soups perfume my house. When I cook and bake, it’s in a tiny urban kitchen with an even tinier toddler underfoot, so it’s imperative that my meals and goodies come together effortlessly, which is why I like to rely on my slow cooker to help me out. Making an apple crisp in the slow cooker couldn’t be easier. Just toss the filling ingredients together directly in the slow cooker, sprinkle with a spiced oat topping and cook for 3 hours. The secret to keeping it “crisp” and not soggy, is to cover the top of the slow cooker with a piece of paper towel before covering with the lid. This will absorb the condensation that forms, preventing it from dripping back down onto the oat mixture. While you can use any apples in this recipe, I’m partial to a mix of Granny Smith and Honeycrisp or Gala. Also, important to note: you can make the crisp in advance and use the ‘keep warm’ function on the slow cooker to hold it until you’re ready to serve or you can choose to serve it at room temperature. Whipped cream and/or vanilla ice cream is optional but highly recommended. Spray a large slow cooker with cooking spray. Add filling ingredients: apple slices, sugar, flour, cinnamon and dried cranberries lemon juice. Toss to combine. In a large bowl, make the topping by combining oats, flour, brown sugar, remaining cinnamon, nutmeg, and salt. Stir with a whisk. Add melted butter; stir until combined. Sprinkle apple mixture evenly with the oat topping. Place a large sheet of paper towels over the slow cooker, making sure the top is completely covered. Keep the paper towel taught so it doesn’t drape down over the oats. Cover with the lid. Cook on LOW for 3 hours, (or HIGH for 1 ½ hours) or until fruit is tender and top is browned. 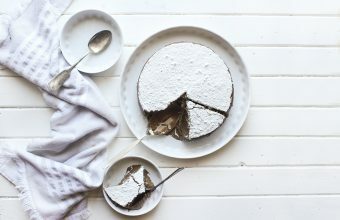 This deliciously smooth and creamy mocha mousse is sandwiched between two thick and crunchy layers of almond meringue. Sprinkle with a generous amount of icing sugar after the mousse has set and enjoy for the perfect weekend winter dessert. This delicious tart marries the smooth a creamy texture of panna cotta with the traditional British earl grey flavoured tea. 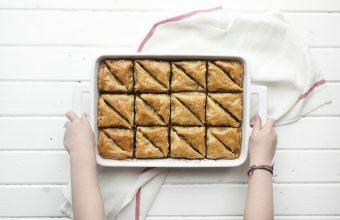 This Chocolate Hazelnut Baklava is filled with flaky, crispy phyllo dough and layered with hazelnuts and bittersweet chocolate. It is topped with a honey-cocoa nib syrup that provides a twist on the traditional dish. It's as if Nutella went on a holiday to Santorini!